As with most timpanists, John didn’t start out playing them. He began his musical studies at age five, on the piano. His father, an Academy Award-nominated composer, encouraged his musical development and John had lessons for the next eight years. “My first piano teacher thought anything written after the 19th Century was just noise,” John says. “So in rebellion, I learned how to play Dave Brubeck’s Take 5 (with an unusual quintuple 5/4 time, hence the name).” During his next piano recital, before the last note of the Chopin etude died away, John broke into a lively chorus of Take 5. He and the piano teacher soon parted ways. John was fascinated by the drummer at his father’s recording sessions and took up jazz drums in junior high school, for a time studying with Ed Thigpen of the Oscar Peterson Trio. In High School, he began studying tympani, marimba and piano, and planned to become a professional musician. Along the way, his timpani teachers have included the composer William Kraft (LA Philharmonic), Roland Kohloff (NY Philharmonic) and Elayne Jones (SF Symphony and Opera Orchestra). In college, John pursued a double major in music and electrical engineering and took lessons from a top studio pianist (Lou Maurey). He was able to combine his interests, receiving a Masters degree in acoustical engineering and working on the designs of many music spaces, including Helman Hall at the old San Francisco Conservatory of Music and the 1976 addition to the San Francisco War Memorial Opera House. And, ever ride BART? John figured out how to reduce the pressure changes when trains go into tunnels. The ears of many riders thank him. Eventually, engineering won out as a career, and John now holds a Ph.D. in biomechanical engineering, from UC Berkeley. He is a former assistant professor in the Department of Radiology at UCSF, where he developed minimally invasive treatments for prostate and liver cancer by freezing cells and monitoring the process under ultrasound or magnetic resonance imaging (MRI). And, he always kept up his music. 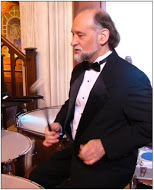 John has performed as a timpanist/percussionist with many Bay Area chamber and orchestral groups in addition to Prometheus (he’s been with us since 2000 and is currently president of our Board of Directors), including the Berkeley Symphony, Oakland Symphony, Oakland Ballet, San Francisco Opera, San Francisco Simfonietta, San Francisco Summer Opera, Berkeley Contemporary Chamber Players, the Cabrillo Festival, and the Redwood Symphony. John also loves contemporary music and runs Laurel Records (laurelrecords.com), a small, elite record company founded by his father, which produces mostly 20th century music of American composers, including the works of Bay Area composer Ernest Bloch and LA composer and former teacher William Kraft. So, how many people now want to hear John play the Tharichen Timpani Concerto? Send us note!